The gentle, ambient heat of the oven treats the lowly chicken gizzard with the finesse and care the rough-and-rowdy surface heat of a frying pan can't. 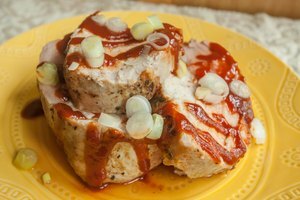 You can achieve two textures when you bake chicken gizzards -- tender or chewy -- and both add variety to your variety meat. 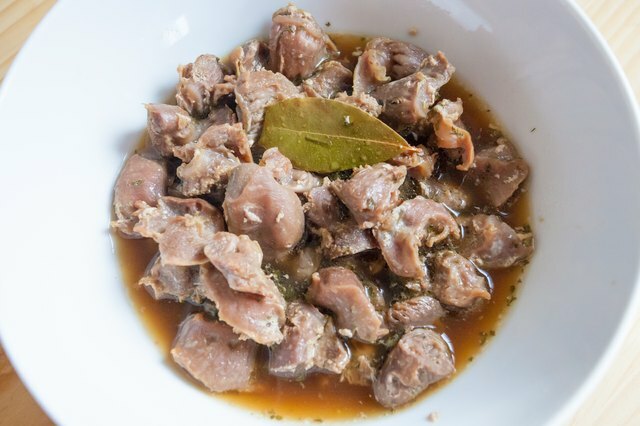 Slow cooking gives gizzards a smooth, buttery tenderness, like braising does; high-heat roasting gives them a substantial bite that draws their flavor out on the palate as you chew. 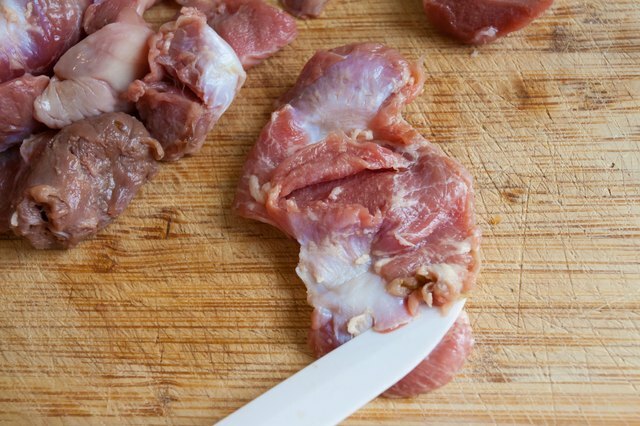 Slice the gizzard equatorially using the visible, diagonal seam as your guide. Rinse the gizzard halves under cool water. Work loose the debris from the crevices of the cut surfaces of the gizzard halves using your fingertips. You'll usually find sandy bits and a small piece of stem or two. Trim off the lip of dense tissue that runs around the edges of the cut surface of the gizzard halves. 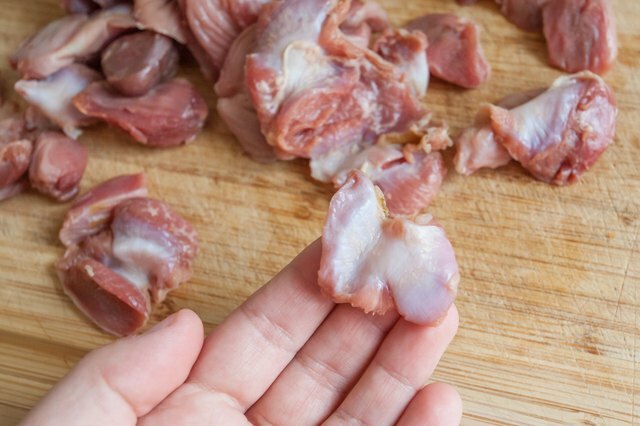 You'll expose about 1/4 inch of the grinder plate -- an interior portion of the gizzard that pulverizes foods -- when you trim away the lip that encircles the gizzard halves. Trim off the grinder plate from both gizzard halves. You'll see the dark, maroon-colored meat of the gizzard after slice off the grinder plate. 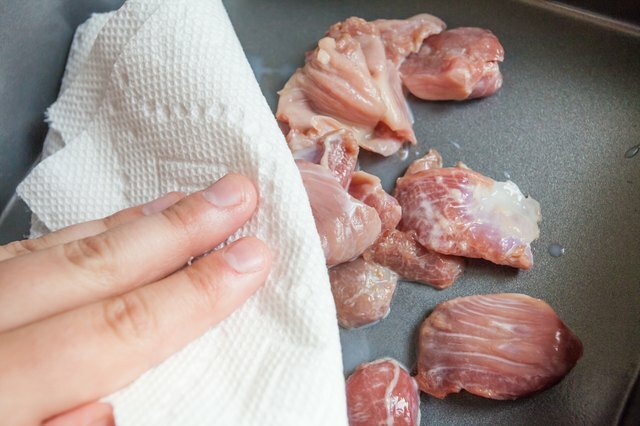 Lift up a portion of the connective tissue that encases the gizzard halves with the tip of the knife. Pull off the connective tissue, called silverskin because of its iridescent sheen, with your fingers. 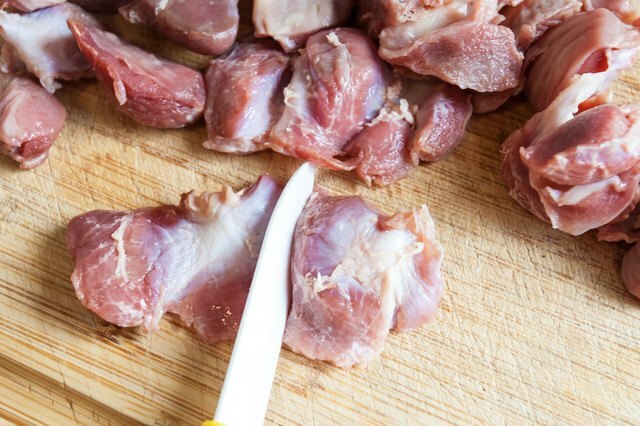 Trim the knobby exterior and cut surfaces of the gizzard halves with the knife until smooth. 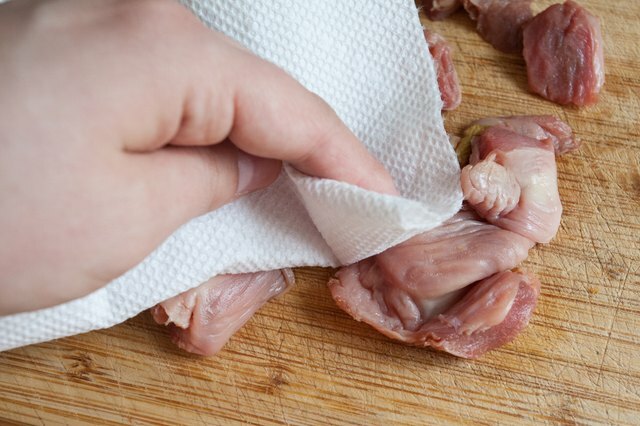 Rinse the gizzard and pat it dry with a paper towel. 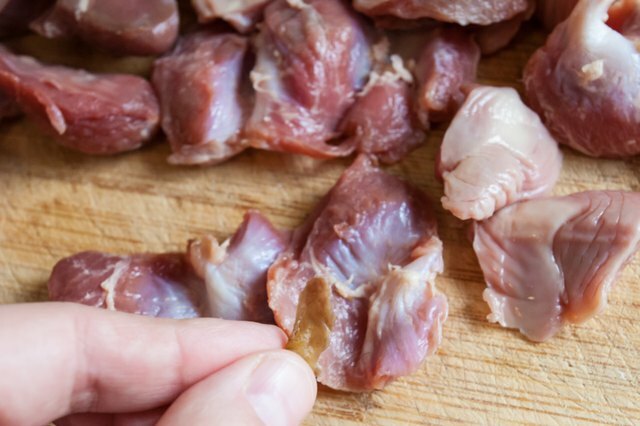 Slice the gizzard into 1/2-inch pieces. 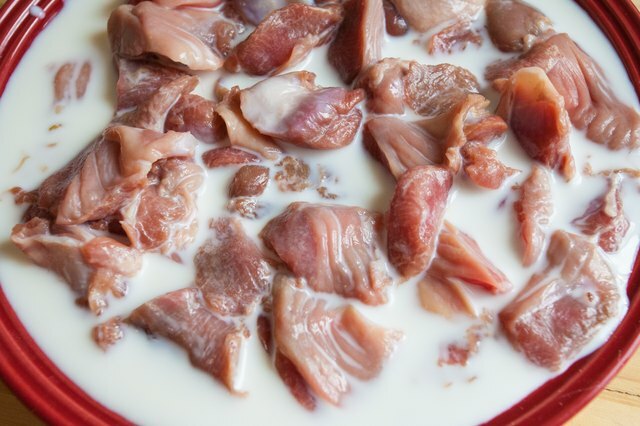 Marinate the gizzards in cultured buttermilk or yogurt for 12 hours, if desired. 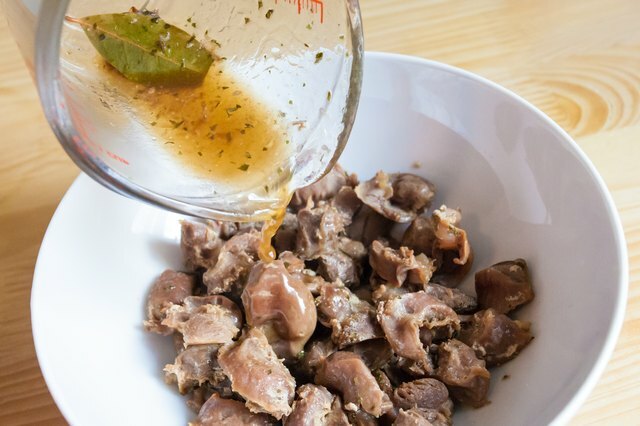 Lactose and active cultures tenderize offal cuts like gizzard particularly well, and also soften their gamey flavor; marinating is, however, optional. 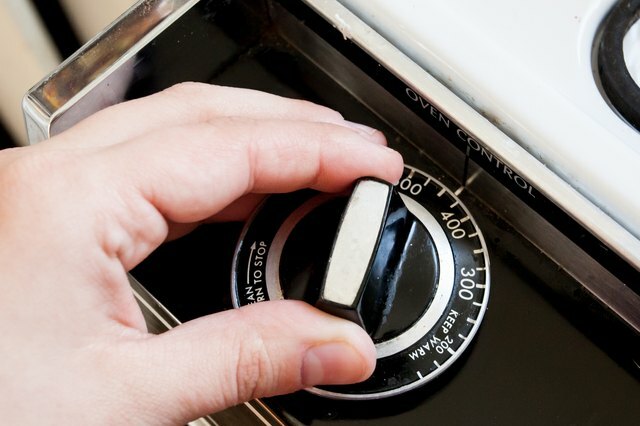 Heat the oven to 450 degrees Fahrenheit. Rinse the buttermilk or yogurt from the gizzards and pat them dry. 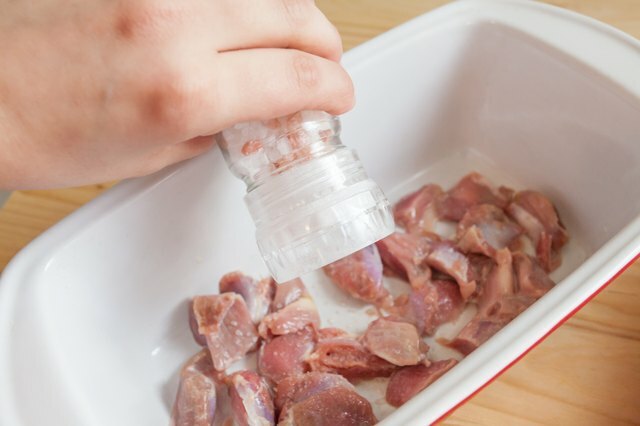 Season the gizzards to taste with kosher salt and freshly ground black pepper and place them in a shallow baking dish. 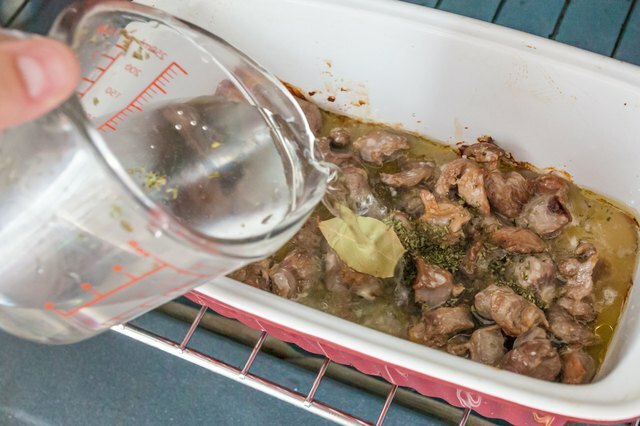 Coat the gizzards in vegetable oil and place the dish in the oven. Roast the gizzards until evenly seared and golden brown, turning them over in the pan. It takes about 10 minutes to sear gizzards in a 450 F oven. Pull the oven rack out and add about 1/2 inch of boiling water or stock to the baking dish. Add fresh herbs and spices to the water or stock if you like. 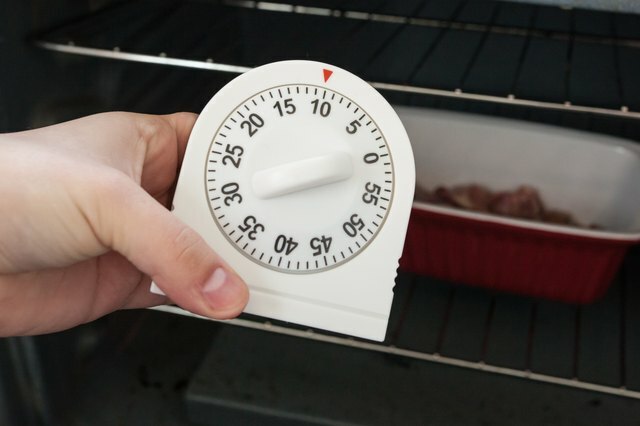 Lower the oven temperature to 300 F and bake the gizzards until fork tender, about 2 hours. 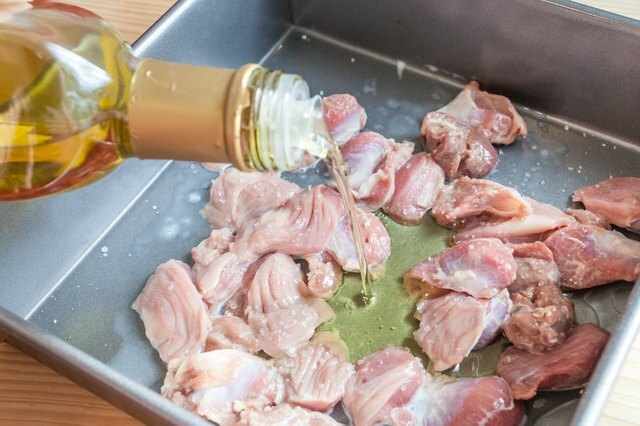 Serve the pan drippings over the gizzards to make the most of the dish. 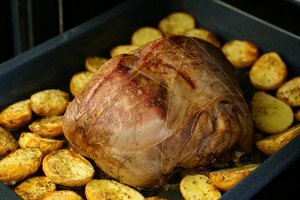 Heat the oven to 350 F. Rinse the gizzards and pat them dry with a paper towel. Turn the gizzards over in the pan after 15 minutes of cooking. 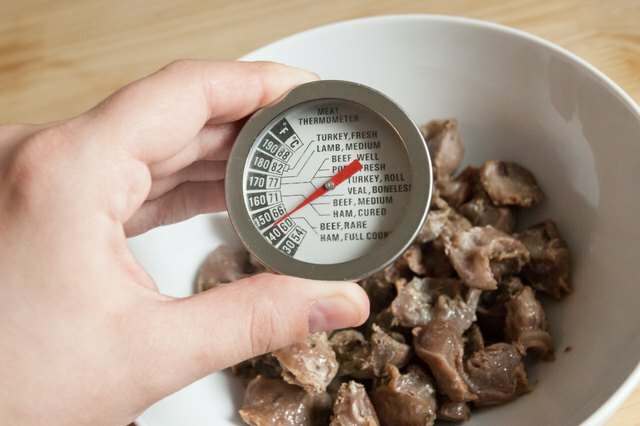 Roast the gizzards until they reach 165 F internally, as measured by an instant-read thermometer -- about 30 minutes.